That's right, "pottery making" for the iPad. Experience wheel throwing without the mess or frustration! I don't know whether to laugh or to cry. Best comment, from "Jim": "For $5 I certainly hope the ghost of Patrick Swayze will mount me from behind while I am playing with this." Indeed. thanks for the fav! you throwing pots still? Amazing work man. Truly inspiring. Let me know if you have any art shows coming up. We live in SD but will make the trip up... Thanks for sharing. you are incredible, I am learning how to pull walls right now, I saw your video on youtube, wow, what an inspiration! Hello, I saw you taking pictures at the Wedge on Sunday. I was just wondering if you were going to upload them? I was the one who gave you my e-mail address. I had the yellow board with a blue bottom. you took some pictures this weekend of my White Shepherd. I believe this is the website that you told me to visit. Is there any way you could send them to happycruzer@gmail.com ? Hi! Beautiful gallery! I am the founder of a group [link] that you might be interested in joining. If you are interested, check it out. I'd love to have you as a member! I was wondering what your cone 10 recipes for shine and that awesome moss green you have. 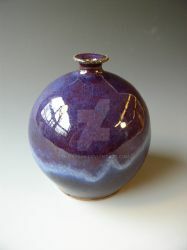 please send me a PM with the formula and any websites you know of that have nice cone 10 glazes. Nice work by the way i also work in that scale but i have not posted anything on deviantart in a while. what happened to the ceramics. did u stop? Love, love, love your double-walled vessels. Absolutely beautiful.